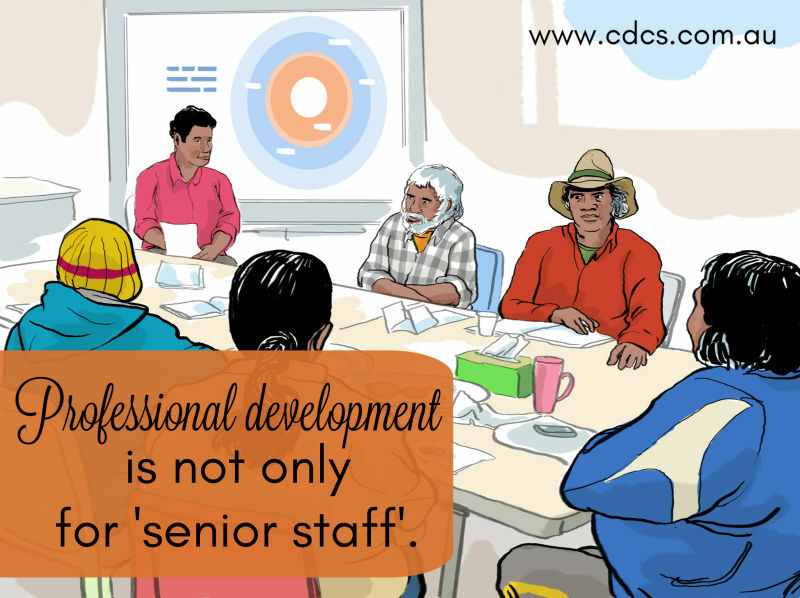 If professional development is something that is viewed as ‘only for senior staff,’ then the organisation is selling itself short. While it’s great that support workers or supervisors are undertaking certificate-level aged care training, this should be supplemented with opportunities for professional development too. Professional development opportunities may include attending workshops or industry-run forums. They can also be in-house training sessions; we know of a few organisations who regularly bring their coordinators and team leaders together either on a face to face basis or via remote linkups to participate in training sessions and information sharing. Other professional development opportunities can include specific skills training, such as participants learning how to write professional progress notes or conduct client assessments. Don’t overlook the opportunity to open professional development up to volunteers and family carers either – after all, in a rural and remote setting these people are a pool of potential future employees. What benefits are there for your workforce, and ultimately your organisation, by participating in professional development opportunities? No one likes to feel like they are in the dark. Whether it’s writing and getting people to understand policies and procedures, or teaching someone a task, we have found that people need to know why they are doing something, not just what to do. It might take a little more time to ensure that people understand the context of an action or activity, but it pays off in the long run. Next time you are introducing a new process or reviewing your policies and procedures with your team, take the time to talk through the ‘what’ and ‘why’. You will likely find that it sticks better in the minds of staff members. Whenever we are running a workshop, it’s always rewarding to see the ‘light bulb’ moments. When you explain something to a group, such as putting something into context for them, they then have the underpinning knowledge about why they need to do a certain task and how to best complete that task. In turn, their confidence grows. When they are able to share that information with others and demonstrate their understanding, you know you have done your job right as a trainer. With the change to the Aged Care Standards this year, you might want to think about how you can include staff in the process of implementing the new standards in your organisation. Come Quality Review time, those staff who have participated in the process will be more confident in their service’s position when speaking with an assessor. Participating in professional development opportunities can break up the monotony of a person’s day-to-day job. Not only do staff learn skills or techniques and improve their knowledge when they attend workshops, they also have time away from their normal role, giving them a mental and physical break. This combination of time away from the workplace and added information or knowledge and skills can have the effect of improving both the energy level of the individual and their answers to issues can be more creative and successful. This year, can you plan for some of your staff to attend an industry conference away from their workplace; or if that is not possible, a day on-site where staff can participate in learning and development opportunities? The community care sector is filled with people who have a large capacity to care for and support others. It attracts some of the very best people. However their compassion and caring can backfire and lead to a burn out. Give your staff and volunteers the opportunity to learn skills that don’t relate directly to the provision of care, but more to understanding and learning self-care techniques. It will pay off in the long run by supporting good physical and emotional health within your team. Being known as the organisation, or section within your organisation, that provides professional development opportunities for all your staff can also improve retention rates. People stay because they see you and the organisation recognising and investing in staff. Of course, your service exists because the organisation has an end user who accepts services from you. These clients will prefer to interact with staff who understand and have the right skill sets to meet their needs, are able to provide culturally safe supports and have the right attitude. Having staff who have undertaken training and development to improve their knowledge and skills in supporting clients, understanding programs and gaining relevant management or supervisory skills, as well as caring for themselves, will result in improved outcomes for clients. Can you find opportunities for your supervisors or coordinators to learn a new support skill or something that widens their knowledge base that can improve staff and client interaction? It can be far easier in rural and remote settings to employ and promote from within your community and organisation. Accommodation for staff who are not already living in the community is in notoriously short supply in many remote communities. If you can source your staff from within the community, they often already have accommodation. However, locally sourced staff may have literacy and numeracy shortfalls and may not have had the opportunity to attend formal training in aged care. By providing them with certificate-level training, targeted literacy and numeracy training, and one-to-one mentoring, these staff members can become the backbone of your team. The organisation is also making a positive contribution to the community and individuals by creating and supporting real jobs for local people. Once you have developed people within your organisation, you want to keep them. Showing them a career pathway may assist in retaining staff and mitigating the subsequent loss of knowledge, which happens with staff turnover. By supporting and encouraging skilled and knowledgeable staff members, you reduce the gaps that can occur when using people hired from outside the organisation. If you find someone within your organisation who has the aptitude to take on a senior role, you should seriously consider how you can provide professional development opportunities for that person. Can you have them work alongside you as you carry out coordination and management tasks? Can you take them to management-level training and networking opportunities, such as industry events or manager masterminds? For example, in the Inner Circle MasterMind that CDCS facilitates for rural and remote managers, we encourage the Managers to bring along a Board Member or a senior staff member; this opportunity supports the organisation in developing additional personnel, improves the organisation’s understanding and capacity, and promotes team cohesion. Where organisations have supported their team through professional development opportunities, we observed the services were better equipped to deal with change and continuity was supported even when senior staff positions change over. Think about your team. What can you do to support their professional development? You have the opportunity to make your organisation an even better place to work – one that people are attracted to, one where people feel valued and supported. If you found this article interesting, please share it with others in your network who may also gain something from reading it. Why not take the opportunity to sign up to our email alerts? We provide a round up of the month’s posts and other significant industry related news. It’s a great summary and easy read! You will also receive a quick email whenever there’s a new blog post ready to read.